NuMedica Mag-Plex Ultra is offered in convenient capsule form and is formulated to provide you with the magnesium necessary for muscle, nerve and energy support. Magnesium is crucial in more than 300 enzyme-related processes that regulate the body's chemical reactions, such as protein synthesis, muscle and nerve function and the regulation of blood pressure. It is necessary for healthy bone development, as well as the synthesis of DNA and RNA. NuMedica Mag-Plex Ultra supports the body's processes by effectively preventing or treating magnesium deficiency. Mag-Plex Ultra features magnesium lysyl glycinate chelate, a form of magnesium that is easily absorbed and utilized by the body. The supplement also offers the patented di-magnesium malate from Albion ® Advanced Nutrition, a world leader in patented mineral amino acid chelate and organic mineral acid complex research and development. NuMedica has partnered with Albion® Advanced Nutrition's mineral technology to ensure the provision of the highest quality minerals for optimal health. Magnesium deficiency is associated with major health conditions, such as diabetes, heart disease, osteoporosis and certain types of cancers. Early signs of deficiency include loss of appetite, chronic fatigue, muscle weakness and digestive issues. Ensuring that your body receives a sufficient supply of magnesium is crucial for short and long term health and wellbeing. The body requires magnesium for numerous processes, including energy production, muscle and nerve function and blood pressure regulation. It also plays an important role in the transporting of calcium and potassium ions across cell membranes, which is crucial to proper nerve impulse conduction, normal heart rhythm and muscle health. Various studies have showed that magnesium supplements can prevent high blood pressure in people who have prehypertension. While magnesium is readily available in a wide variety of foods, it is often in a form that cannot be easily utilized by the body. For this reason, many individuals take a magnesium supplement such as Mag-Plex Ultra to ensure that they ward off magnesium deficiency. 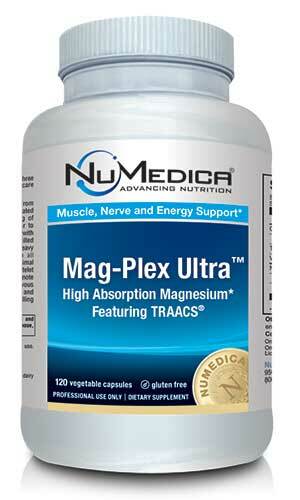 NuMedica Mag-Plex Ultra makes it easy to prevent a magnesium deficiency. Taking one tablet 2-3 times per day provides enough magnesium to ensure that you receive this mineral's maximum benefits. Mag-Plex Ultra - 120c 1 Capsule 120 Take one capsule 2-3 times daily between meals or as directed by your healthcare practitioner. Mag-Plex Ultra - 240c 1 Capsule 240 Take one capsule 2-3 times daily between meals or as directed by your healthcare practitioner.